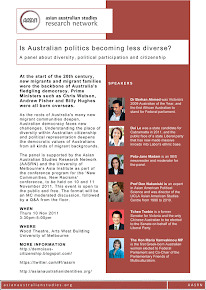 The panel is being held at the Wood Theatre in the Arts West Building at the University of Melbourne on 10 Nov 2011 3:30pm. If you are arriving by car, the closest drop off point is the intersection between Royal Parade and Genetics Lane. If you are arriving by public transport from the city, catch the Route 19 North Coburg tram and get off at Stop 10 on Royal Parade, which is next to the Royal Melbourne Hospital. From Royal Parade, the Arts West building is behind the Melbourne Conservatorium of Music and the Genetics Building.